In 2017, we set forth a vision to establish our pulp business as a growth driver for the company. Since then, the pulp leadership team has enacted tangible plans to optimize and improve operational and environmental efficiency at our core pulp mills. We’re reaching this goal through a combination of capital investments and continuous improvement projects that are growing our business into a world-class global supplier with strong, long-term customer partnerships. This summer, our Kamloops Mill took a significant step forward thanks to key projects that are improving employee safety, production and environmental efficiency. Here are some examples. A redesigned chip pre-steaming bin is eliminating a problem that slowed production and posed a risk of injury. A chip pre-steaming bin is a giant steel container where wood chips are softened for processing into pulp. The mill’s previous bin was gravity-fed, meaning chips softened by steam would settle to the bottom and flow into the digester for further processing. But the gravity feed didn’t always work as intended. Rather than settling down and out, sometimes the steam-saturated chips would plug the flow. 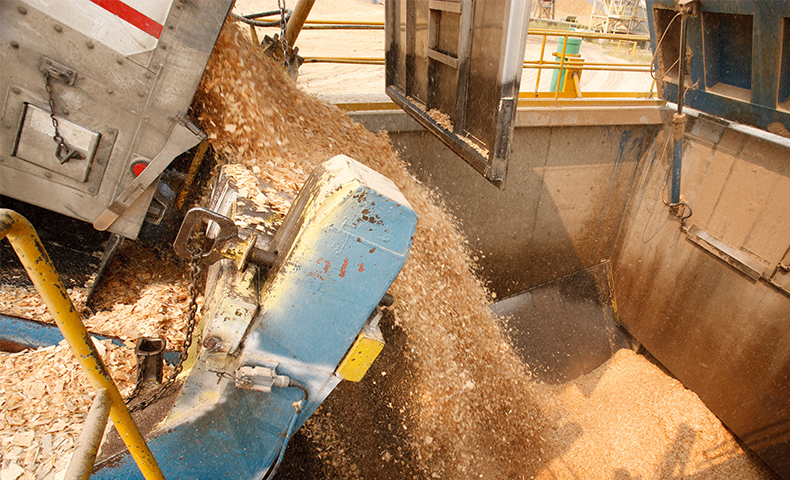 Chip pre-steaming bin at our Kamloops Mill, where wood chips are softened for processing into pulp. It was more than a minor nuisance. Frequent plugs (approximately 55 per year) were costing the mill up to 5,000 tons of lost production every year. The only way to alleviate the plugging issue was to slow down the digester (and by doing so, the entire mill), which meant sacrificing another 17,000 tons of annual production. Even worse, clearing the plugs was a manual task that put employees at risk of injury. The standard practice was to insert a long pole through the side of the bin to try to break up the plug, but the chips and gas that accumulated during the bin plug could push employees backward. Thanks to capital investment and employee ingenuity, the Kamloops Mill retrofitted the bin earlier this summer. Now, instead of relying on gravity to move the chips, the bottom of the bin has mechanical screw feeders that churn the chips to move them through the bin more reliably — greatly reducing plugs and avoiding lost production. Mill Manager J.C. Allaire says the chip bin update has been an important part of the mill’s ability to increase its daily pulp production by 8 percent so far this year. A key step in producing clean white market pulp is bleaching the wood fibers using chlorine dioxide. Afterward, emissions from the bleaching processes pass through a pollution control device called a scrubber that removes residual chlorine dioxide before discharging clean emissions into the air. 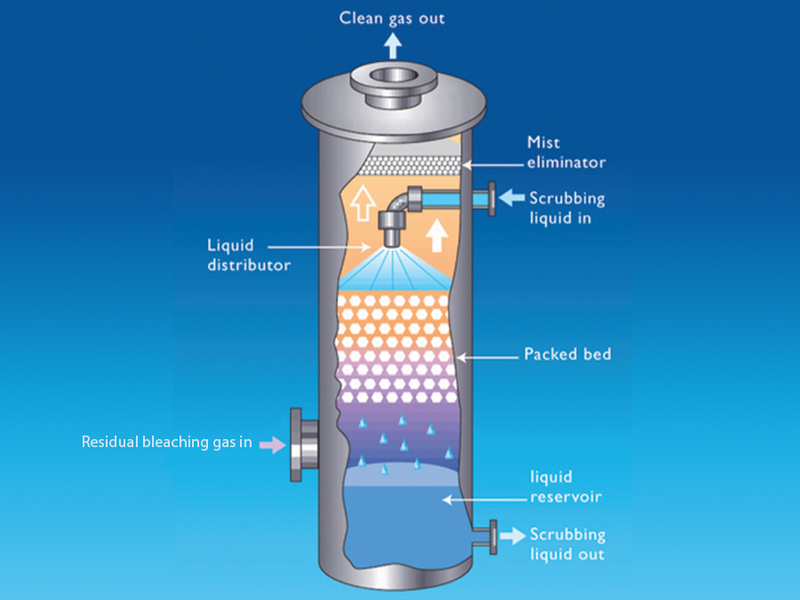 Diagram of how a scrubber is used to remove residual chlorine dioxide before discharging clean emissions into the air. The mill had been using a solution of water and liquid sulfur dioxide to treat the chlorine dioxide. However, liquid sulfur dioxide is a hazardous chemical to handle and store. In fact, it was the most hazardous chemical at the mill. 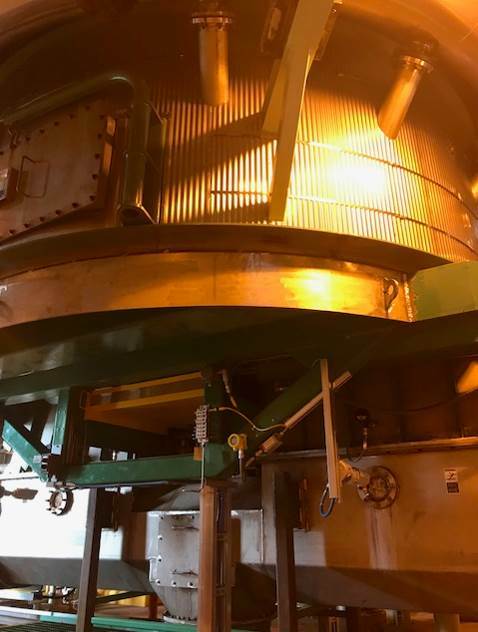 Thanks to an investment project to improve environmental efficiency, the Kamloops team replaced the existing scrubber with an updated version that completely eliminated the need to use sulfur dioxide. The new scrubber is also bigger, so it can more efficiently collect and treat 100 percent of the bleach plant’s atmospheric emissions. All of Kamloops’ pulp production comes through just one machine, so any inefficiency, no matter how small, can affect the mill’s production. Using the same operational and environmental efficiency audit that identified improvements in the chip bin and scrubber, the mill team identified other projects that can improve production. These include upgrades to several key areas of the mill that were completed during its recent prescheduled maintenance. Those projects are delivering outstanding results. In fact, Kamloops has already set a record for its best seven individual production days in mill history. “We set a new production record on a Tuesday,” Allaire says. “Then we bettered it three times by the following Sunday — an outstanding 10 percent improvement over our previous record.” Allaire says the whole mill team is responsible for this success because the vast majority of the work was done in-house. Allaire credits Kamloops Mill employees with identifying projects that have improved operational and environmental efficiency and increased productivity. The mill also has the opportunity to grow those initiatives through company-funded investments.